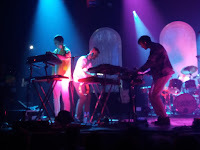 Django Django is a live force almost despite itself it seems. From the very first seconds of the show rhythm was the keyword. Relentlessly the beat was bestowed upon us. However, that's only one side to the band. If it was about beats only, I would never have been present. 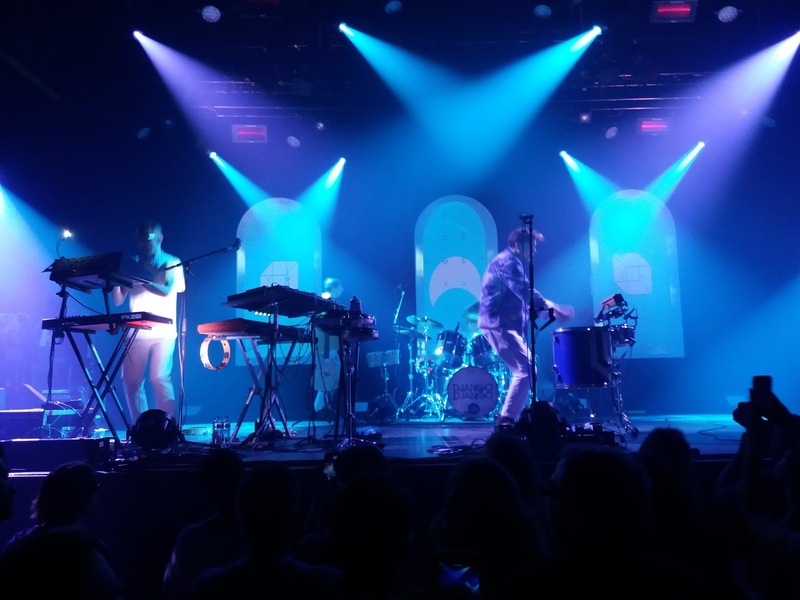 Django Django perfects the joining of beats with melodies and songs, resulting in one and a half hour of moving and dancing. How to translate the many layered, mostly electronic music to the stage? That was my question before attending my first Django Django show. Yes, some sounds and electronic rhythms seemed to come out of a box. Did it matter? Absolutely nothing and this is why. The drummer Dave Maclean keeps a tremendous rhythm going the whole of the time. Some fantastic rhythms were produced from behind his kit. Despite being at the back, as drummers tend to be, it was a joy to see him at work. He is the only band member to remain on his post during the show as we will see. From a barrage of keyboards and sequencers and who knows what else Tommy Grace produced all the electronic sounds and melodies required with a lot of energy. He's clearly enjoying his status of rock star. The two more front men, bassist Jimmy Dixon and singer/guitarist Vincent Neff are more rockstars against all odds. More like two men who find themselves so successfully on stage but never expected nor strived to be there. Both have obviously grown into their role. Together they take care of the vocals and harmonies that are such an important part of why I like this band so much. 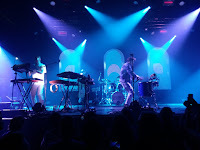 To top it all off, all play percussive instruments or part of the drum kit if an extra rhythm is required, Or all move to the keyboards and play something together there. It gave the show tremendous pace and energy. These extras give Django Django live the oomph some songs need to come alive this just a little bit more. Another thing I noticed is that live maybe not everything on the record is played, so some elements within a song get some extra attention. To me that revealed some of the influences on Django Django's music that are not so obvious on records. The Eurythmics, Pet Shop Boys, the commercially successful synth bands of the 80s, showed through alright. I have one complaint though. Where was 'Giant'? I certainly had hoped the band would play its best song, but alas. All the other songs compensated for that fact. The oriental, near instrumental 'Cairo' was fun to hear. Just like hearing some of the other songs of the first album live like 'Default'. 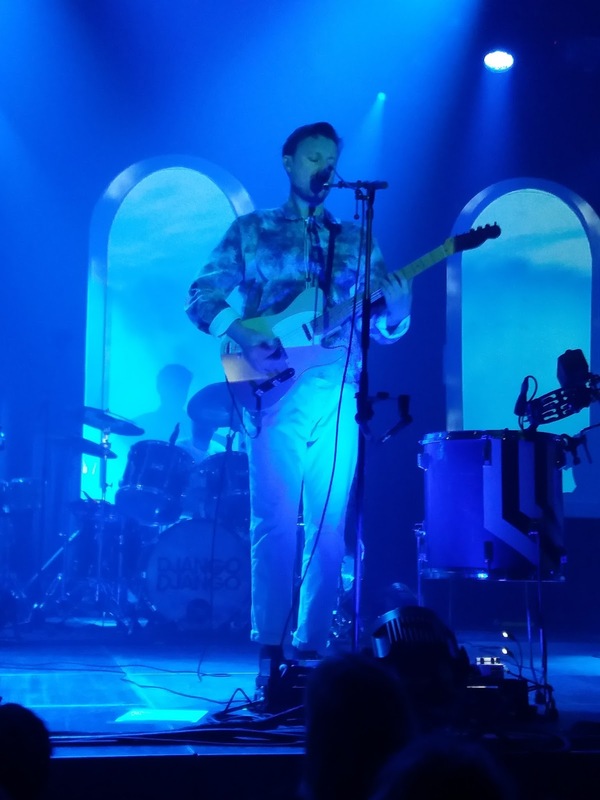 The songs that attracted me to Django Django in the first place, despite the fact that 'Born Under Saturn' and 'Marble Skies' have eclipsed the album totally, as far as I'm concerned. What I saw is a band that enraptured the venue totally, with a both sympathetic, energetic and simply very, very good show. Nothing got too wild, agreed, but then the band itself is not wild. In a way that may be disappointing as some of the songs deserve total abandon, yet now the show was enjoyable without having to watch my body's health being attacked from all sides. Swaying to all the rhythms with a huge smile on my face, totally relaxed without a worry in the world. Yes, a great show. Thank you, gentlemen. Finally, one question. Can someone explain to me why a holed lid was put on and off one of the synths, while it was played either way? Why the difference? That would be a nice to know. And yes we have an answer on Twitter from @Nutstradamus: "Thanks! The card I think you r talking about is this http://www.vintagesynth.com/sites/default/files/2017-05/jen.jpg … . It goes over the knobs of the synth and has marks so I can quickly dial up a sound." Quite practical indeed.